The Snake River here in Jackson Hole, WY is still running fast and muddy. Current flows are 4230 cfs out of the Jackson Lake Dam and 9360 cfs at Moose, WY. The good news is that the major tributaries such as Pacific Creek, Buffalo Fork, and the Gros Ventre River look to have peaked and are beginning to trend down. This is great news after a long runoff season! At this point, any guided fishing trips on the Snake River have been more of a scenic float with a casting lesson. There are a few small trout to be caught in the slowest of water types, but the best fly fishing of the season is yet to come for sure. We look forward to running more guided fishing trips on the Snake River by the end of the month. Stay tuned for more details…. 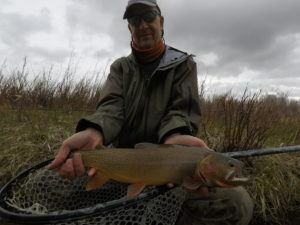 Here’s the latest Jackson Hole fishing report, sorry to keep you waiting! Fly fishing has been solid, despite higher than average flows on the Snake River. The Snake River dropped and cleared last week and the results are in the net! Flows were dropped out of Jackson Lake Dam to 2000 cfs and the cooler weather brought runoff to a halt on our tributaries. Great hatches of BWO’s, Skwalas, Caddis, and a few March Browns had our Snake River Cutthroat looking to the surface for their next meal. Focusing on slower water types and side channels with less volume saw the best surface action. We used the drift boat to float to likely fishing spots and walked around on foot. We also parked on relatively slow riffles for the most consistent action. Fly fishing from the boat was best with streamers such as Olive and White Double Bunnies or Black Leeches. Flies that were retrieved with quick 1-2 foot long strips were the most productive. Slower riffles or banks were great places to toss a streamer or nymph rig. We fished a two fly nymph rig, with 5-6 feet of leader before the first fly, typically a #8-12 Stonefly nymph on 3X. Our droppers have been a mix of #12-16 Pheasant Tails and #10-14 Hare’s Ears, roughly 18″ below the point fly. Both Olive and Red Copper Johns were successful droppers as well. The Upper Snake River basin is currently at 165% of average for this date. 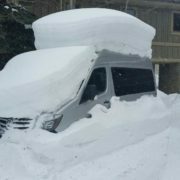 Not surprising since we received 3-4 feet of snow above 8000 feet through the week! The switch has flipped to more Summer like weather this week, and as a result river flows are on the rise. Runoff will last into July this year on the Snake River. Our long-term forecast for the next few months shows more precipitation. Call us to find out where we are fly fishing before you arrive. Stay tuned here for an up-to-date Jackson Hole fishing report! 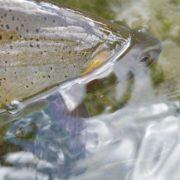 Or give us a call at 307-690-1139 to book a guided fly fishing trip in Jackson Hole. The Jackson Hole Valley has seen some cooler weather over the last couple days with the occasional rain shower. This is great for fly fishing, it resets the Snake River! This weather gives the fish a chance to rest, but it also creates great moist habitat for bugs! At Moose, Wyoming the Snake River is 64 degrees fahrenheit while flowing at 3810 CFS, in the canyon stretch above Alpine, Wyoming the Snake is flowing at 3640 CFS. With this new weather coming in, our Fall hatches have begun. Hecuba Drakes, Mahogany and Blue Duns, and even a few Blue Winged Olives. Add Tricos and terrestrials and you’ve got quite the menu to choose from! The Snake River Cutthroats are still eating Claassenia Stoneflies, especially in the mornings and later in the afternoons. I like to fish a smaller male Claassenia stonefly attractor such as Circus Peanut (size10-12) in the mornings and twitch them along the surface. Remember that these male bugs don’t have fully formed wings and tend to skitter along the surface(before they get eaten!). In the afternoons, I prefer a Purple Bruce or September Stone (size 8) that lands with a splat! The splat imitates a female returning to the water to lay her eggs and will attract more trout. The Snake is a great place to nymph, and our best trout are being caught sub-surface. Blonde Rubber legs, Drake nymphs, Caddis nymphs, Pheasant Tails (size16-18), Copper Johns (size16-18, red or copper) all have been working this week! When nymphing try to achieve the longest drift possible, this entails mending maybe as many as a dozen times in one drift! Keeping your nymphs at holding depth will raise your odds of catching more Cutthroat trout. Four to six feet is typically deep enough for the Snake River, and can even be shallower depending on water type. Our guides have been fishing the Snake River all season, and are excited about the new hatches coming into play. Fall fishing is going to be fantastic this year! Feel free to call us at 307-690-1139 or check out our Snake River page online. The old cooler measuring trick with a nice Snake River Cutthroat! Sorry it has been so long since our last fly fishing report! 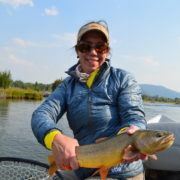 The Snake River in beautiful Jackson Hole, Wyoming is fishing very well right now. The Snake is currently 66 degrees fahrenheit at Moose and is flowing at 3360 CFS, while flowing at 3870 CFS in the canyon stretch above Alpine, Wyoming. 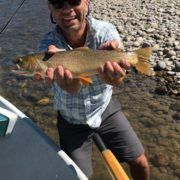 With this warm weather in Jackson Hole, Wyoming mornings are the best time to fish, the water is still cool from the night before and the fish will be more active in cold water. Once mid afternoon hits, the water will begin to warm up and the fish will become lethargic and less active. The Fine Spotted Snake River Cutthroat are eating the circus peanut (chocolate sizes 8-10), mutant stone fly (sizes 8-10), hoppers, beetles, and flying ants. The Snake River is a great place to spend your morning searching for Snake River Cutthroat Trout, and our guides have all the bugs the fish are eating! A nice Snake River Cutthroat Trout during a beautiful day in Jackson Hole, Wyoming! Some happy clients with Fish The Fly Guide Will Pierce! 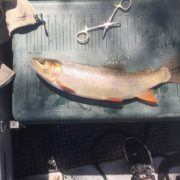 Despite recent wildfire activity in Wyoming, our backcountry creeks are fishing very well! 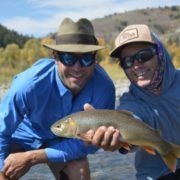 Jackson Hole, Wyoming has many different backcountry fly fishing locations, many of which do not get fished very often and are relatively remote. If you like being the only fisherman on the water, and not seeing another angler all day, the backcountry of Wyoming is the fly fishing spot for you. The cutthroat trout in Wyoming’s backcountry are opportunistic and looking to feed! Caddis, Green and Grey Drakes, and PMD’s are always popular in the backcountry. The cutthroat are still eating Stoneflies, with a Circus Peanut bringing up lots of trout. Give your foam bug some extra movement on top of the water; try skating it across the surface heading away from the bank. The grass hoppers are also starting to come out, so if you see some hopping around the bank do not hesitate to throw one on the end of your line! 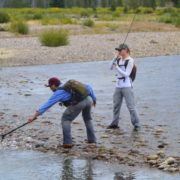 Fly fishing in the Backcountry of Wyoming is a great full day trip, which all fishermen can enjoy. 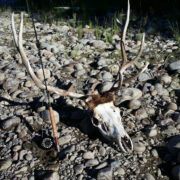 An old Elk on the river bank of one of our Backcountry creeks! Flawless Fine Spotted Cutthroat Trout caught in the Wyoming Backcountry!